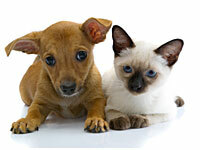 Are Cats or Dogs Better for Your Health? 1. Boosting your mood. More than 80 percent of new owners report feeling happier. 2. Making friends. British researchers found that owners who walk their dogs meet a lot of new people. 3. Losing weight. Dog walkers lose an average of 14 pounds in a year, a University of Missouri study says. 1. Helping you chill. Most owners say their cats help them relax. 2. Protecting your heart. A recent study shows that cat owners are 40 percent less likely to die of a heart attack than those without cats. 3. Ditching asthma. Kids with cats may get an immunity boost, Columbia University researchers say.